The EU banks have the highest percentage of their revenues coming through digital channels than banks anywhere else in the world. The Chinese fully integrated social, ecommerce, financial services platform referred to as BAT (Baidu, Alibaba and Tencent) — used as a shorthand to cover many more Chinese firms — are coming to disrupt the global financial ecosystem. Without diminishing some of the interesting and innovative breakthroughs that are taking place in India, Japan, SE Asia, Africa and South America — the real Superpowers of the FinTech Revolution are the US, China and the EU (with the UK inside — for now). All three markets are placing huge focus on digital innovation in financial services, resulting in most of the largest players in the industry emerging from these markets. The “Superpower” with the largest economy is the US, closely followed by the EU and then China — respectively with GDPs of $19 trillion, $17 trillion and $12 trillion in 2017. As we know, the EU is a partnership between 28 countries with a common market that for almost all relevant purposes allows its members to operate as if they were one market. Even with the departure of the UK, the EU economy would be about $3 trillion larger than China’s . All three Superpowers have huge populations. China is of course largest with 1.3b citizens, followed distantly by the EU with 511 million and the US with 325 million. If we overlay GDP per head the US and EU are multiples of China — $8,000 compared to $33,000 for the EU and $59,000 for the US. The size of the Chinese middle class is very small compared to the US and EU — less that 1% of the population earns over $18,000 a year. Interestingly, the public believes that China has a far larger economic clout than the size of its economy would suggest — in fact 42% of European believe this while only 9% believe the EU is larger. The EU definitely has a PR problem. 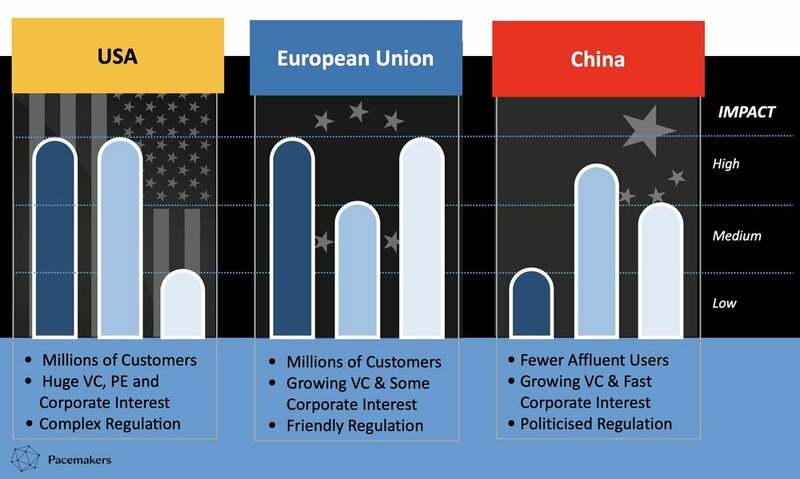 The size of their affluent customer base gives the US and the EU a real upside in driving FinTech. The US has a history of making a success of digital innovation. Five of the top 10 largest companies in the world by market capitalisation are US tech firms — all less than 20 years old. In 2018 the three FinTech Superpowers took the lion’s share of VC investment in the sector with US companies being the largest recipients. If we take out the one-off investments in Ant Financial and Du Xiaoman, Chinese FinTech firms raised about $7 billion while the US firms raised 16 billion and the EU raised just short of $7 billion. All three markets are also seeing a growing interest from corporates. In the EU, big Banks ( 8 of the top 20 largest banks worldwide come from the EU) are taking a real interest in investing in FinTech. These giant investment pools ensure that entrepreneurs are able to find the investment needed to implement their vision, to attract the right talent and to compete with the incumbent or their customers. Last but not least, regulation has a huge impact on the success of FinTech. This is where we see the largest differentiation between the three markets. The US has a very fragmented regulatory environment. Many FinTech find that they have to be regulated at both the Federal and State level. This adds complexity and cost. China’s has a diametrically opposed approach. Banking and FinTech are regulated by the China Banking and Insurance Regulatory Commission an agency of the People’s Republic. CBIRC brings together the banking and insurance regulators is visibly government linked, this could make it seem both a financial authority and political tool. This could potentially make it harder for Chinese companies to be given easy access to US and EU markets. Europe is still regulated by the regulators in the 28 states but their activity is supervised and harmonised by the European Banking Association. The EBA was founded in 2011 to increase transparency in the EU banking sector — one effect of its activities has been that of enabling most banking activities to be ‘passported” across the member states. This has created a Single Market for financial services where a company regulated in one market can (almost always) serve customers in all other EU markets. The rollout of PSD2mandating all banks to offer APIs to their services is a great example of how the EU is pushing for harmonised innovation across all its markets. This strength is why even post Brexit all indications are that the UK will remain closely aligned with the EBA. All three markets have spikes in their competitive outlook vis-a-vis each other. But one market offers a sizeable target base, access to capital and supportive regulation: The EU. Next time you see a presentation hailing strength of GAFA and BAT, ask them about EBA. Could the future of FinTech be European? It just may.